After winning a game show contest, a newlywed couple travels to New Orleans where the husband seeks to reclaim his ancestral plantation mansion from his biracial stepbrother. Detective Sergeant Johnson: God! Oh God! Superb psychological thriller with a brilliant Connery performance. 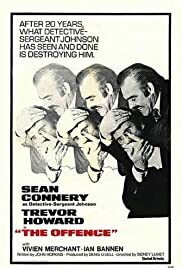 This is a superb psychological thriller with a brilliant lead performance from Sean Connery. Connery plays a police detective nearing burn-out, the fuse for which is provided by a child molester on the loose. When a suspect (Ian Bannen) is arrested, the detective takes it upon himself to interrogate the man -- and ends up beating him to death. From there, the film examines what drove the detective to do it, through individual scenes with his wife (Vivien Merchant) and the internal affairs officer investigating the beating (Trevor Howard). The final third of the film takes us step by step through the interrogation, as Bannen turns the psychological tables on Connery, making the detective see exactly the sort of animal that he has become as a result of twenty years of dealing unrelentingly with violence and death. John Hopkins' screenplay plays very much like a stage play (it was adapted from Hopkins' play "This Story of Yours"), but in this case it works to the film's advantage as Connery's life is compartmentalized (by virtue of the scene structure) in a way that makes his personal life seem completely walled-off from his job, and his job completely walled off from the interrogation. As a result, his character's inability to deal with anything but his job (and consequently, even that) gives us marvelous clues as to why he does what he does. Sidney Lumet's direction -- his third venture with Connery (previously the two worked on two of Connery's best films: "The Hill" (1965) and "The Anderson Tapes" (1971)) -- utilizes the stagy conventions well to advance the story and to enhance the performances. As for the performances, these are uniformly excellent. Connery has never been better, playing a character who is anything but invulnerable, instead being a bundle of nerves and frustrations which explode into violence at crucial moments. Bannen is every bit his match as a complex, manipulative character who is at the same time sympathetic (as Connery's victim) and repulsive (for the sadistic delight he takes in pushing Connery's buttons). Indeed, one of the strengths of the story is that it is never revealed whether Bannen did in fact molest the children in question -- by doing so, the film makes us understand that this is not the issue. Instead, the film is more about internal demons -- how we all have them, and how we can either control or be controlled by them. Howard is solid in what is perhaps the least interesting role in the film, but Merchant is phenomenal as Connery's plain wife, who has withstood his emotional abuse and neglect for years, sometimes in silence, sometimes not, but always with dignity. In perhaps one of the most poignant moments in the film, Connery, half-drunk, looks up at her, and asks in wonderment, "Weren't you ever pretty?" Merchant's lines following that are less important for their text, than for her reading of them -- wounded, but still confronting her husband like a prize fighter who's determined not be knocked out by a cheap shot in the fifteenth round. Perhaps the greatest tragedy of this film is that it is practically unknown in the United States, and that it did not air in enough American theaters to qualify for the Oscars. Otherwise, it would quite likely have resulted in Oscar nominations for Connery (in an otherwise weak year for the Best Actor category, the only comparable performance nominated was Al Pacino's in "Serpico"), Bannen, and Merchant, not to mention Hopkins and possibly Lumet. All the same, definitely a film worth seeing if you're tired of watching detective films where Bruce Willis or Mel Gibson blow away half of Los Angeles.